We are very proud to announce that Mirrored Media has been named a 2017 Summit International Marketing Effectiveness Award winner in two categories. The Summit Marketing Effectiveness Award (Summit MEA) allows advertising companies to demonstrate their ability to influence consumers’ knowledge, attitudes, and beliefs. The business of advertising is about creatively and effectively executing an advertiser’s goals, and the Summit MEA gives successful firms an opportunity to highlight their effectiveness. 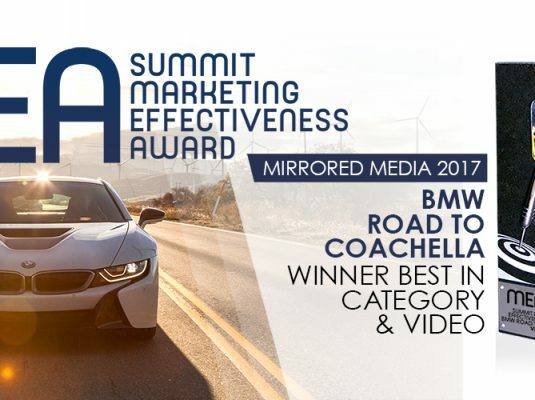 Our influential BMW Road to Coachella campaign was awarded in both categories. Advertising and marketing firms face a number of barriers, including small budgets, product quality and pricing, selection, competition, distribution, geo-political and macroeconomic issues. The Marketing Effectiveness Award offers creatives an opportunity to present ways they have overcome barriers to deliver a successful campaign. The Summit Creative Award, Summit Marketing Effectiveness Award, and Summit Emerging Media Award are all piloted by the Summit International Awards, a US-based organization. The Summit Award is not tied to an advertiser, magazine, trade association, ad club or other outside influence. The Summit Awards is independent and international in its scope and focuses on identifying creative, superior, and effective marketing. It conducts impartial, ‘blind’ judging events and, once completed, recognizes, celebrates, and promotes creative, effective marketing on behalf of winning companies and individuals. Its judging process is impartial and free from outside influences. It withholds both the names of the judges and entrants throughout the entire evaluation process. Both judges’ and contestant’s names are withheld until after award-winning entries are selected. This anonymity shelters all involved from any vested interest that may attempt to influence the award’s outcome. Summit Marketing Marketing Effectiveness Award – Over the past 24-years, the Summit Awards has established itself as one of the premier arbiters of creative and marketing excellence. Being recognized by the Summit Awards brings your company prestige and additional value, and we salute you. Winning provides validation of your work and functions as a respected industrywide critique. This honor can also aid in your efforts to attract new accounts; reinforce relationships with clients; reward employees, partners, and subcontractors; and motivate team members. The Summit Marketing Effectiveness competition is based on the premise that the goal of marketing communications is to change, influence, or reinforce a target audience’s knowledge, attitudes, or beliefs. Using this premise as a basis for its judging criteria, the competition is a true arbiter of marketing communication effectiveness. When a submission achieves the goal of marketing communication effectiveness, judges recognize it with a silver and platinum-level wins. They granted this status to only 9% of the submissions in this year’s competition.